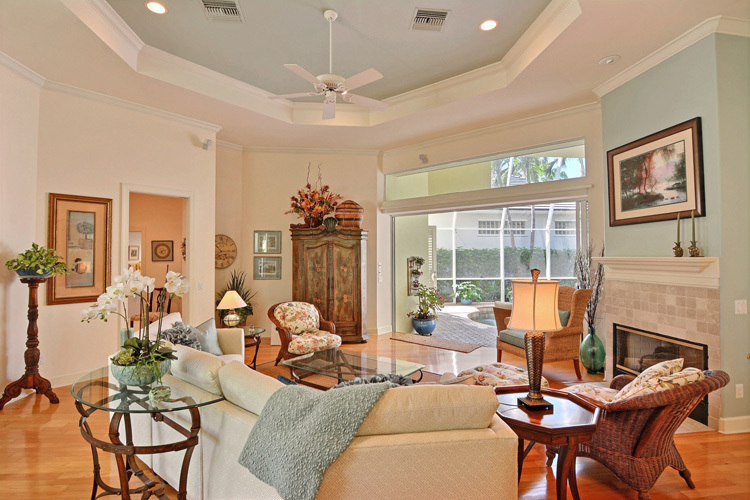 Rarely will you come upon a home like the airy, light-filled beauty at 100 Mariner Beach Lane. Mere steps from the blue Atlantic, this 3-bedroom, 3.5-bath gem possesses perfect flow from room to lovely room and from indoors to outdoors, the lofty ceilings, unique architectural features and immaculate color palette combining to offer its fortunate owners a beautiful abode that radiates tranquility. The recently-renovated house sits back from the street, nestled within tropical landscaping: a pleasant mix of low foliage and palms of varying heights. 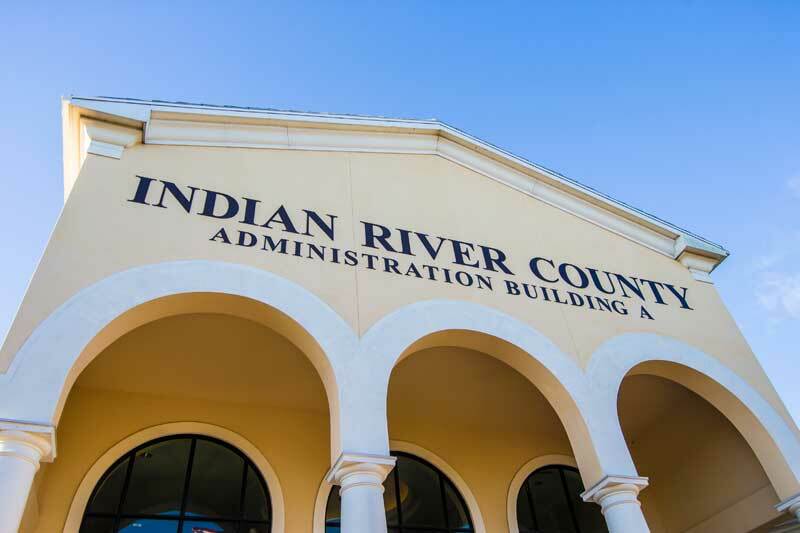 The exterior is a pale yellow, the trim white, and the roof lines, arches, columns, bays and balconies assure an abundance of curb appeal. 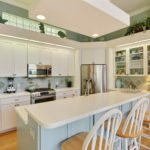 Homeowners Christie and John Brooks, recently undertook extensive updating. With a love of nature and a delightful sense of whimsy, Christie Brooks has showcased the home’s unique charm with brilliant material, color and design choices. As you tour the home, you’ll see that the furniture and interior décor has been chosen to perfectly enhance the home’s design. Christie Brooks says that, except for the dining room set, all the furniture can be negotiated as a package, separate from the home itself. A short, arched portico leads to the home’s entrance – an elegant etched-glass door with glass sidelights. Stepping across the threshold into the great room is an almost theatrical wow moment. 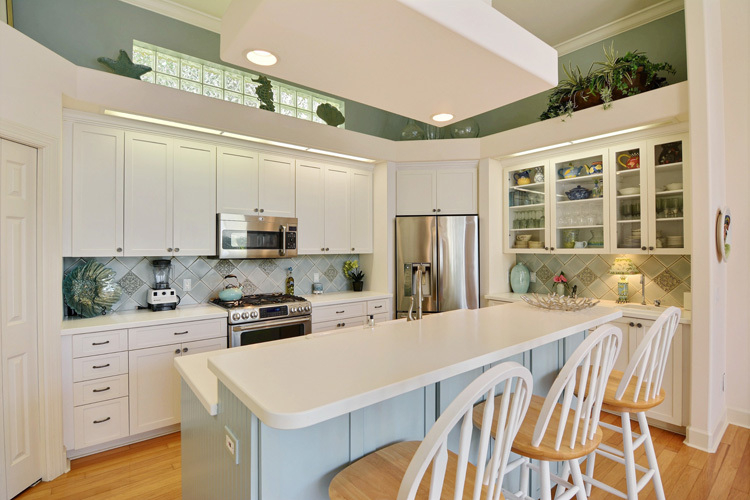 The walls are whisper yellow, the soaring octagonal tray ceiling a soft blue-green-gray with white crown molding; a low fireplace with pale tile surround and white mantle is the centerpiece of a gray-blue bump-out wall; the honey-warm hardwood floors continue throughout the main level. This stunning room opens to most of the other main-level rooms and offers a truly gorgeous, expansive view to the lanai and beautiful lagoon pool and spa. 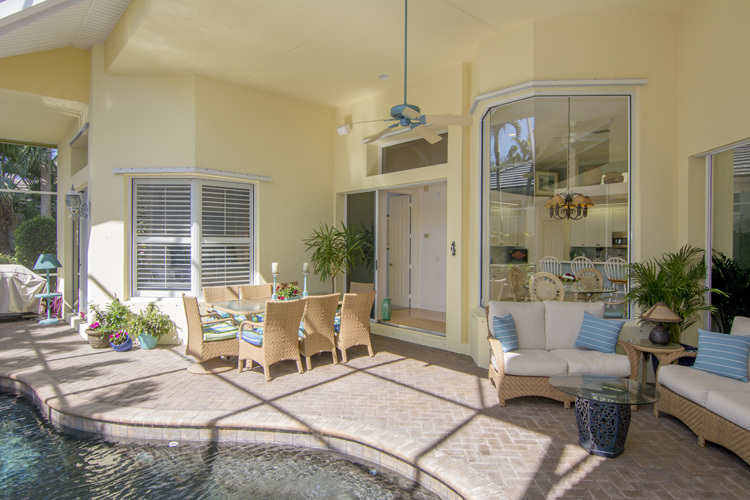 The covered lanai extends into a large exterior space with dining area, casual seating and pool deck. Off the great room, the open dining room features a mirror wall topped with three rows of glass blocks; and an arched display alcove in contrasting blue-gray. 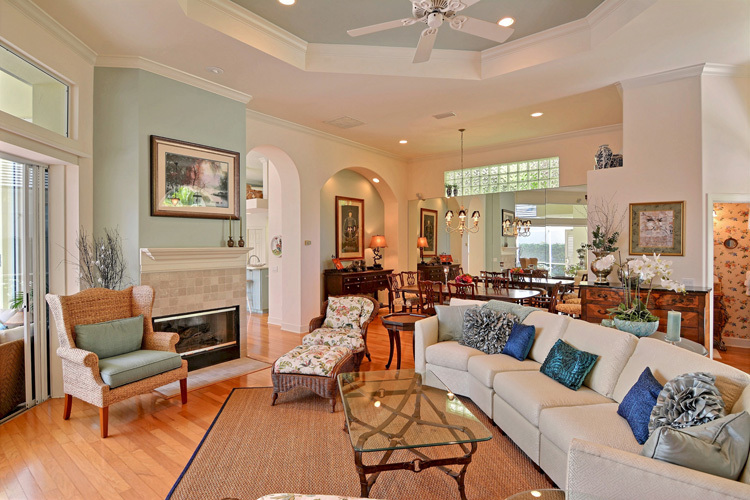 Also off the great room is a study with custom, wall-to-wall shelving, cabinet and TV unit. This flexible room could easily serve as library, office or extra bedroom. The powder room is a charming surprise, with a lovely honey-colored, furniture-style vanity, gold-framed oval mirror and flowered wall covering. Another smile-maker is the well-equipped laundry room, bright and airy with blue and white gingham print wall covering. 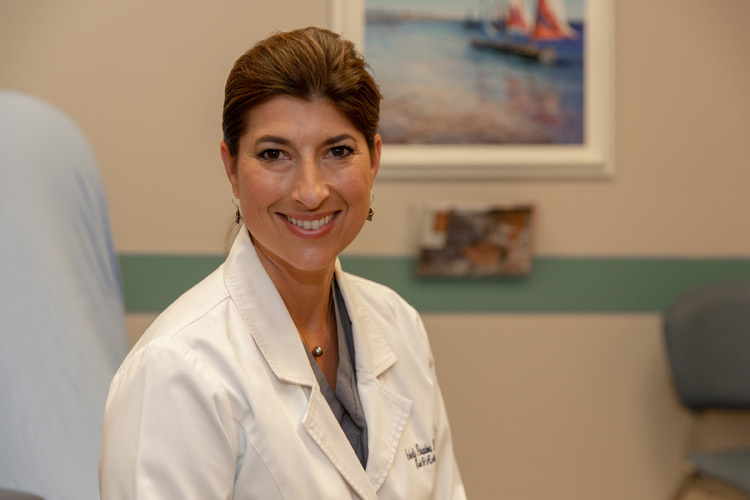 The Brooks’ favorite renovation is the kitchen, an appealing chef-friendly space that will certainly continue to be a gathering hub for family and friends. 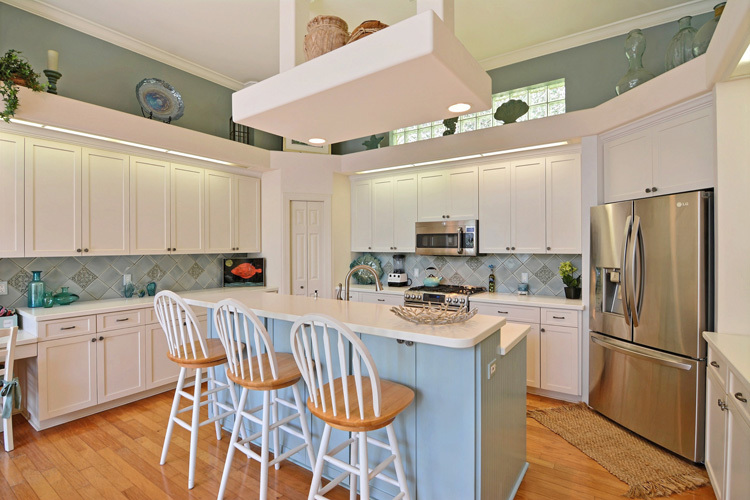 The white cabinets and white Corian countertops; blue-gray, Italian tile splash; above-cabinet display shelving and white suspended display shelf above the island create a kitchen like no other. The top-of-the-line (GE Cafe) appliances include a 4-burner, plus grill, gas cook-top, double oven, a large French door fridge with wine bottle chiller feature and freezer drawer. 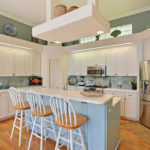 The Corian-topped island sports blue sides and accommodates a deep double sink, dishwasher and roomy lunch bar; a side counter boasts lighted, glass front cabinets and a small additional sink. A panel of glass blocks high on the exterior wall assures ambient light all though the day. 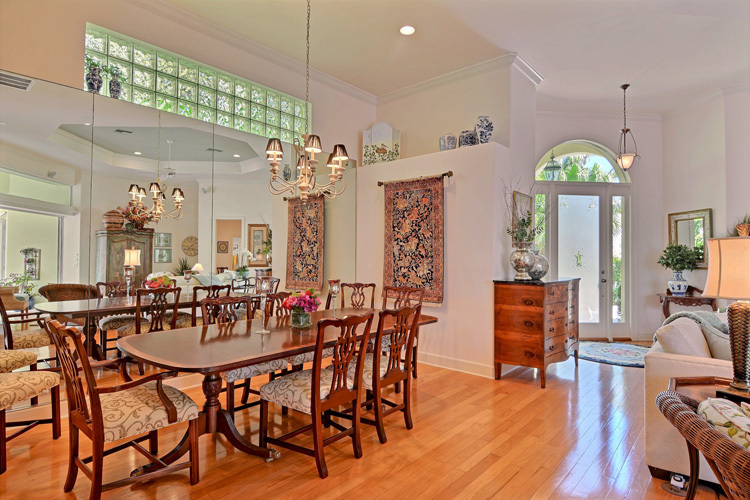 There is a charming breakfast nook with graceful chandelier within a glass-paneled bay looking out on the lanai, the ever-changing deep greens of the lagoon pool and the blue Florida sky. 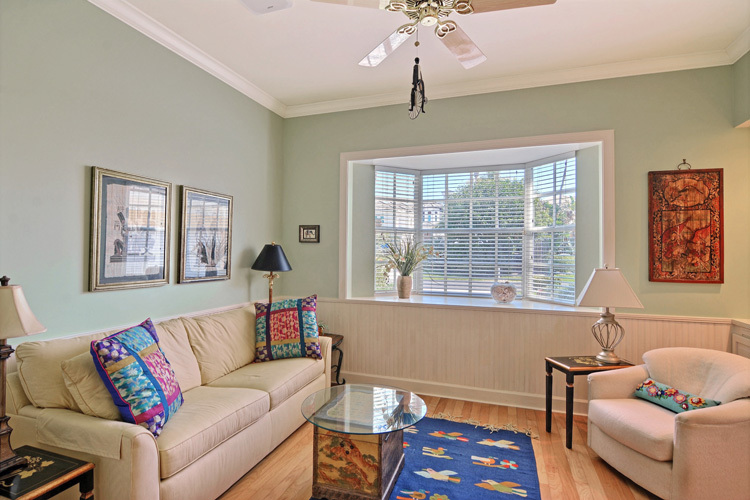 All three bedrooms open to the lanai and all have new dove-gray carpeting. 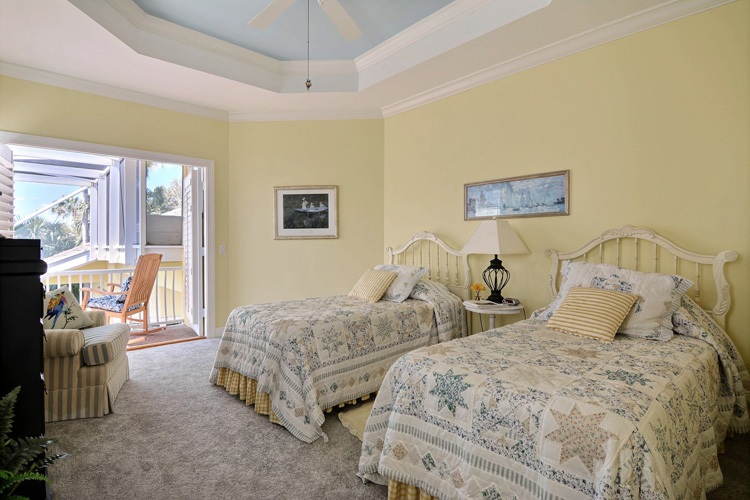 The master suite features the most delicate of blue-gray walls, white ceiling and crown molding, with tall, arched plantation-shuttered windows flanking the bed. Above the doors that open to the pool area, a long glass transom ensures a day-long flow of natural light; and there are a pair of roomy walk-in closets. 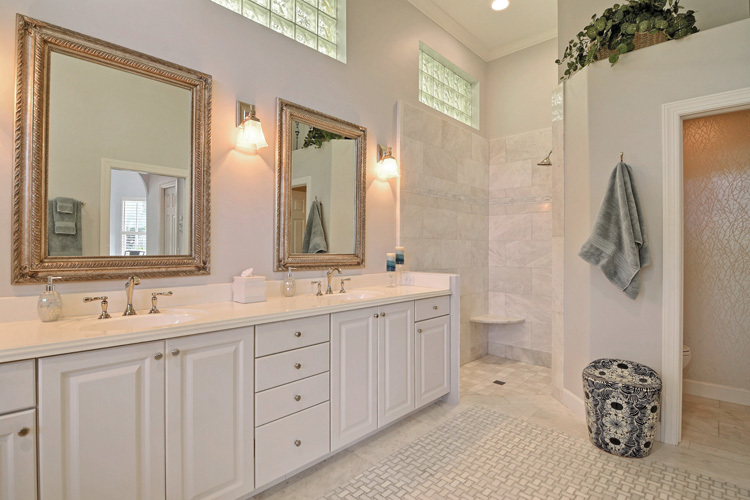 Another of Christie Brooks’ favorite spaces, which she designed down to the last shimmering tile, is the deluxe master bath: a Carrera marble-dressed getaway that will entice you to linger and relax. 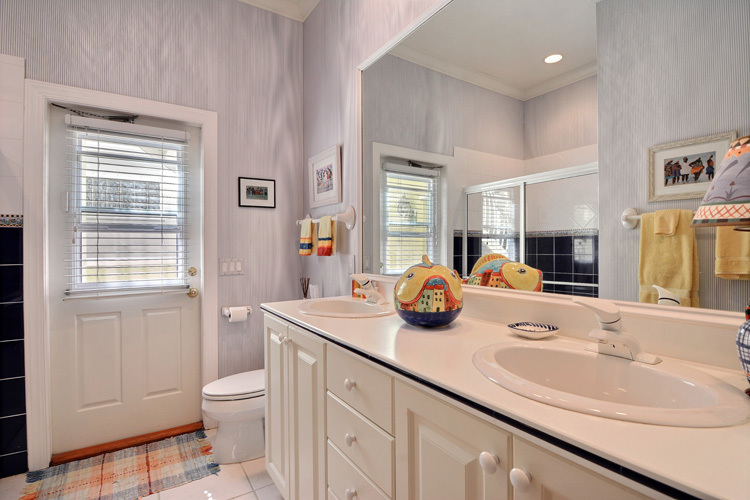 The flooring is basket-weave tile in shades of frost and silver gray. 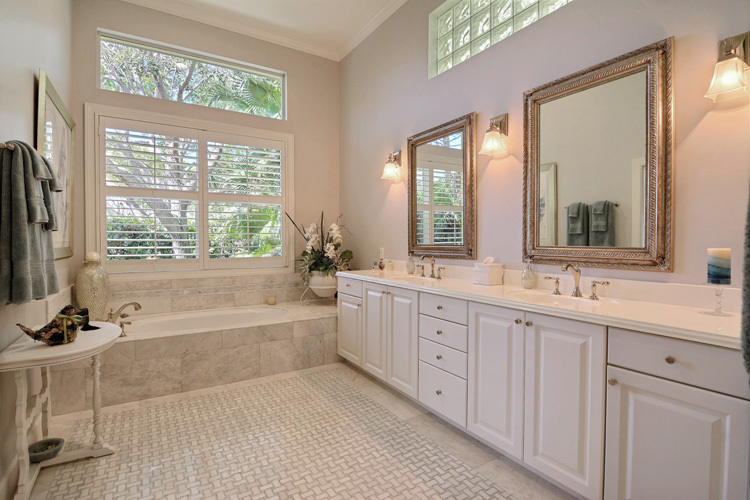 The white double vanity features a pair of gold framed mirrors and frosted glass sconces. Among the room’s appealing features is a large, jetted soaking tub with a truly decadent heated back rest, set beneath a double plantation-shuttered window. Think candles, a mystery novel and a glass of Sauvignon Blanc, and bid farewell to the pressures of the outside world. As much an art element as a functional feature, the beautifully tiled shower is configured so that it needs no door or curtain. 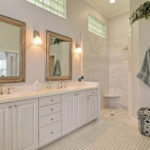 The bathroom also features high, glass block “windows”; high-end fixtures; a water closet with a fancy Toto loo; and a deep, arched alcove with glass display shelves and nifty little towel cabinet. 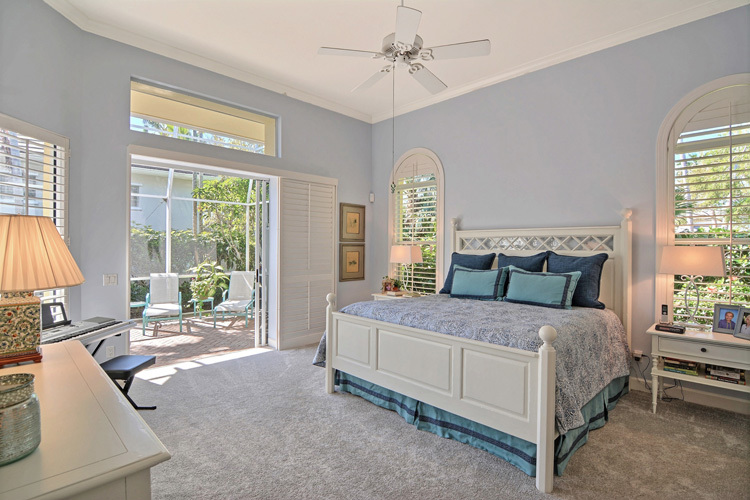 With walls a delicious shade of periwinkle, the first-level guest suite opens to the lanai via double glass doors with plantation door panels that open separately. 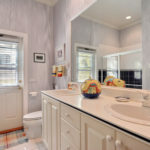 This guest bath also has an exterior door, and a shower with deep blue tile and whimsical fish tile trim. 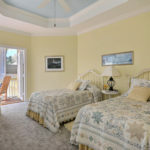 The second level suite is a wonderful hideaway, occupied over the years by the Brooks’ grandchildren. 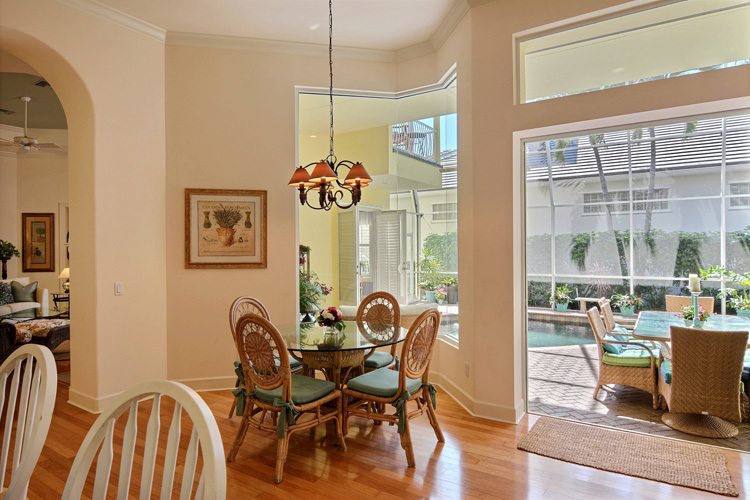 It is accessed from the screened patio via a wide outside staircase. 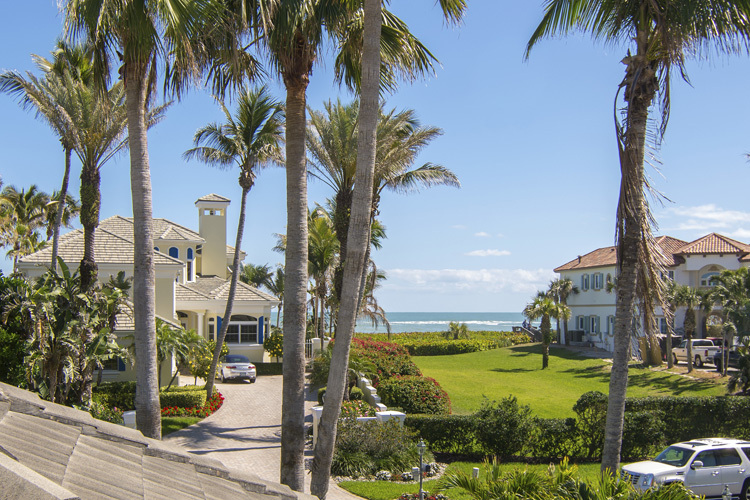 From the top of the stairs, you can look across the street to the neighborhood’s easternmost row of lovely homes, for a breezy view of the ocean. 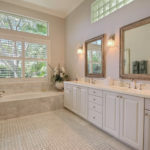 Christie Brooks points out another favorite feature of this Indian River Shores home: while buffered from the direct impact of storms off the coast, the house is still close enough to the ocean to access the beach in mere seconds, and to enjoy the sea breezes and surf sounds throughout the day. 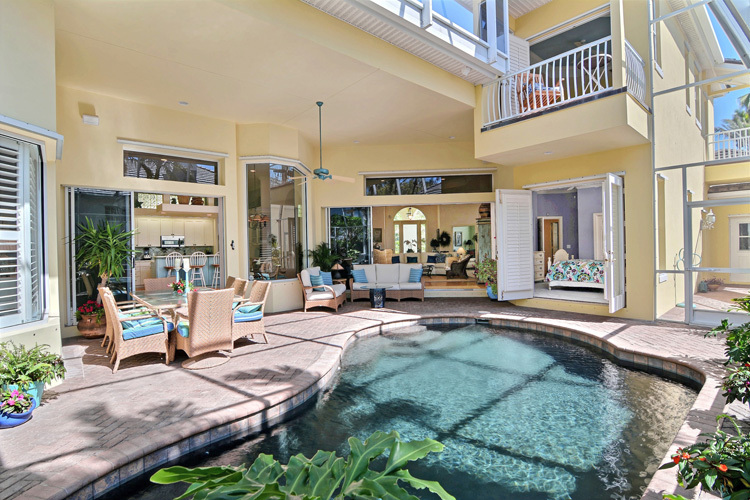 This second-floor suite features a balcony overlooking the pool, where the Brooks’ daughter rocked her babies. This and so many other wonderful memories will go with the couple as they enter the next chapter of their lives. And the home at 100 Mariner Beach Lane is waiting to make memories with its next family.